Has celery “fever” hit your town yet?? I live in LA, and around the new year, the celery juicing trend hit HARD. It seemed every blog I clicked on was touting the benefits of juicing the green stuff straight. The result? ALL THE GROCERY STORES HERE WERE RUNNING OUT OF CELERY!! For realz! There were a couple of weeks there where it was pretty touch and go. I don’t know why, but I found it to be one of the more hilarious things I’ve witnessed here. So what does this have to do with soup? Glad you asked. The whole celery juicing thing got me thinking; there must be other ways to elevate this star ingredient. Why should it always be relegated to an aromatic, or crunchy filler for chicken or potato salad? Onions get to have their moment of glory with french onion soup, so why not celery? 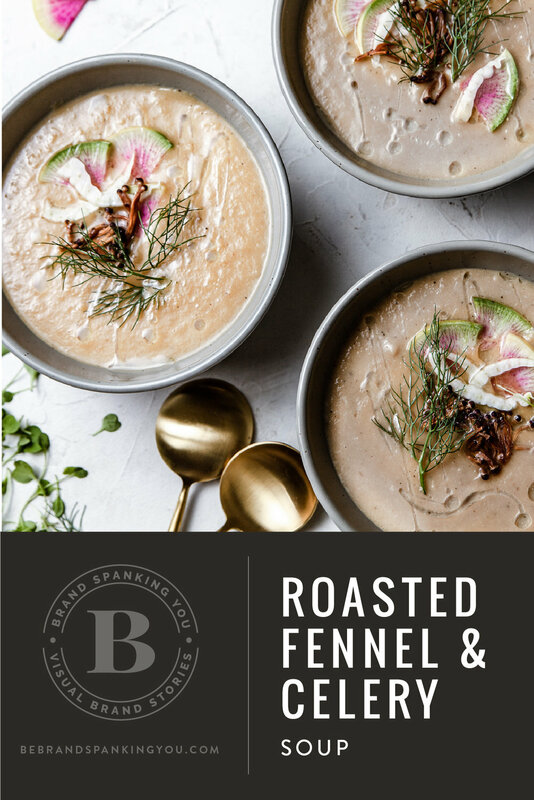 Enter Roasted fennel & celery soup. I LOVE how this turned out. It has an interesting balance of freshness + roasty-ness that’s hard to find in most dishes. Plus, a few baby potatoes make it creamy and filling. Stir in apple cider vinegar and season to taste with salt and pepper.